You have a great idea, now what? That first mile-where an innovation moves from an idea on paper to the market-is often plagued by failure. In fact, less than one percent of ideas launched by big companies end up having real impact. The ideas aren't the problem. It's the process. The First Mile focuses on the critical moment when an innovator moves from planning to reality. It is a perilous place where hidden traps snare entrepreneurs and roadblocks slow innovators inside large companies. 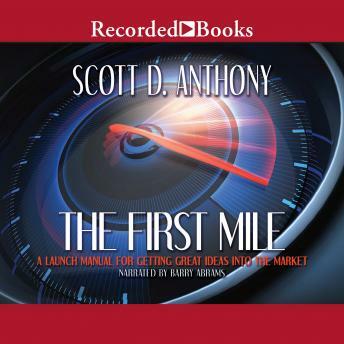 In this practical and enlightening manual, strategic adviser Scott Anthony equips innovators with new tools, questions, and examples to speed through this crucial early stage of innovation. You'll learn: - How to evaluate your idea's strengths and weaknesses using the "DEFT" process-Document, Evaluate, Focus, and Test - Fourteen recipes from an "experiment cookbook" to gain confidence in your idea or business - Why "spinouts," "wrong turns," and other challenges commonly trip up innovation-and the practical strategies you can use to avoid them - Why innovators need to seek chaos in an age of constant change-and other essential leadership skills Drawing on his decade of experience as an innovation adviser and investor, Anthony describes hard-won lessons from disruptive start-ups and global giants alike. The First Mile will give you the knowledge and confidence to travel this perilous-but ultimately promising-terrain. The first mile can be a scary place, but you don't have to traverse it alone. This book can help.